As the most spacious, elegant, and practical model in its class, this is the supermini you need to consider for family transportation or carpooling needs. There is room for all and with ample cargo space you can get everyone and everything where you need to go quickly and easily! It features a 5 seat design and a convenient 5 door layout which gives you quick and easy access to everything inside. 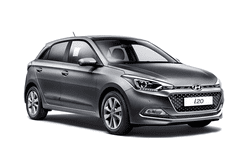 The Hyundai i20 is one of our most popular supermini models and it is easy to see why everyone is falling in love with the newest model from Hyundai. Check it out for yourself and see how perfectly elegance and usability can blend into one amazing vehicle. Get a Hyundai i20 now by giving us a call!